Laughter Yoga Leader Training « Joyworks! There has never been a better or more important time to enrich your own life and those of others with the power of laughter yoga. It’s our tenth birthday this year!We’ve a wealth of experience and knowledge we would love to share with you. Come help make the world a happier and healthier place with the leading trainers of Laughter Facilitation. Laughter yoga is a unique and powerful combination of laughter exercises and breathing based on mime and play. It’s inclusive and universal and used to increase joy, build team morale and improve health. This course is ideal for your own personal growth. It will boost your confidence and self-esteem. You’ll learn about the history of laughter yoga concept, philosophy. You’ll acquire oodles of laughter yoga and relaxation exercises. Opportunities will be given to network, share, try out new ideas and help develop your creative style. 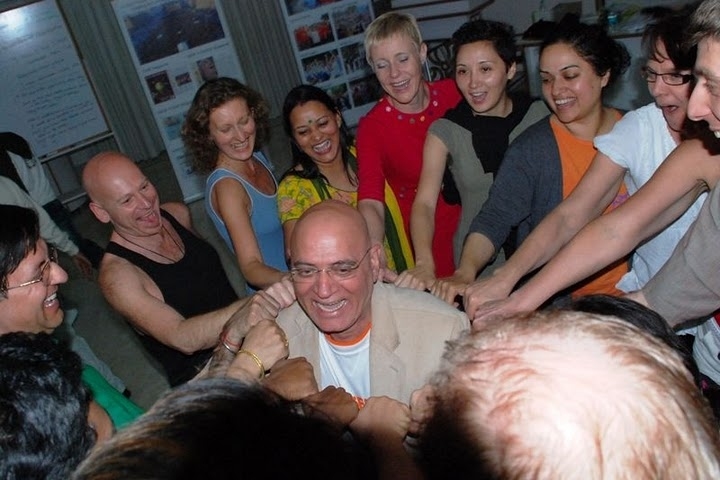 You will be registered as Certified Laughter Yoga Leader and endorsed with Dr Kataria’s Laughter Yoga International, an internationally recognised qualification. You will leave feeling empowered and inspired with a comprehensive e- manual to enable you to facilitate laughter events in a wide range of settings (school, hospitals, seniors, special needs and corporate) or set up your own local laughter club. Hear how some of our delegates will use the technique here. Anyone interested in increasing their own joy and positivity and/or desires to use laughter yoga as a therapeutic or teambuilding tool. Leading big teams and looking for energisers? Want to use laughter for positive behaviour in schools? Desperate to use an alternative to drugs – an effective, simple tool that’s scientifically proven to improve well being? Are you looking to enhance or culminate your yoga classes? Yes this is the course for you. It’s a perfect additional facilitation skill if you are a manager, teacher, workshop leader, nurse, youth worker, occupational therapist, yoga teacher, community worker, carer, therapist, chaplain, clown doctor, team leader or life coach. Course will be led by Joyworks! Director, Sharon Miller who has over 30 years extensive experience working creatively in the arts and education. She trained with Dr Kataria (founder of laughter yoga) in India. She set up the first laughter workshops in Glasgow & Edinburgh. Her team @Joyworks! have been delivering laughter and creative arts events, projects and training across the UK to the health, education and corporate world since 2008. Working with Cocal Cola Enterprises, NHS, BBC Comedy, Nestle, TSB, Scotland Football Team, Diageo and Scottish Water to name a few. We are continually overwhelmed with the outstanding client feedback from our trainings in Glasgow, Edinburgh and Aberdeen. Hear why a nurse travelled all the way from Australia to train with Joyworks here! View photographs from our recent trainings here! Wishing the happiest times sharing laughter yoga to over a 170 professionals who’ve trained with us over the years. Really good balance of demonstration and hands on practice as well as loads of fab ideas. Feel my confidence has increased and knowledge of theory/concept/background of Laughter Yoga has improved. Skills in facilitation have been developed and I feel full of joy and love. Keep doing what you are doing! Please read more outstanding client feedback and press coverage .from our projects,events and trainings in the corporate,education and health world. We have regular development days for qualified Laughter Yoga Leaders – to meet newly made friends , hone skills and learn more from Joyworks! Join our newsletter to find out when. Concessions for unemployed/benefits/groups. Please ask. View photographs from our April Glasgow course here. View photographs from our previous training course here. Our celebrated courses are kept to 12 maximum to ensure the best experience for all. Please contact Sharon to secure a place now on 07713033096 or sharon@joyworks.co.uk for further information.